As soon as I landed in the Basel Mulhouse airport, the first thing that totally took me aback was the exit of the airport. There were 2 exits - one for France & Germany and another for Switzerland. Actually, the Basel airport itself is in France and is called the EuroAirport that serves Switzerland, France & Germany. A shuttle (free if you've booked a hotel/hostel in Basel) takes you from the airport to Basel. Not only is this shuttle, so are all public transport, with what's called the Mobility Ticket which is handed over at the hotel/hostel when you check-in and that's valid for as long as you stay. I went in autumn season, so unlike the picture of typical Switzerland filled with snow, at that time Basel was as hot & humid as Chennai, hotter than London!!!!! The first thing I did was to go to Basel Zoo (another post coming up soon). From there I decided to go on a walk. The Old Town of Basel has 5 self guided, color coded walking tours. A Map of these walks is available free of cost at the Basel Tourism counters, where you can also get the Basel Card. All the tours begin at the Markt Platz. I decided to mix up Grey and Red esp coz both go along the river side and both overlap a lot. Apart from the grey, the rest all are easy walks and are wheelchair accessible as well. The grey route alone has a lot of ups and downs, slanted roads, steps etc. Right at the Markt Platz is the City Hall. Locally called Rathaus, this is a govt building that houses the parliament. This was built in 1504-1514. In brick red it was one imposing facade. Inside where some frescoes and sculptures that were made in 17th C by Hans Bock. Some of the wooden sculptures there definitely looked ancient, which may be the original decor from 1514! From there the walk led to Mittlere Brucke. This is the oldest river crossing across Rhine built in 1226. From this point, the grey route started to have the ups & downs and it began with a street which is actually a staircase of 69 steps!!! Further ahead where some super slanted roads which pretty much reminded me of Edinburgh The Real Mary King's Close. Along such streets where buildings whose height was static but varied in their number of stories according to the elevation starting from 5-6 stories to just 2 at the highest point of elevation!!! Unlike Edinburgh, people still live in these houses and infact in one of the house a bunch of men were playing cards! At the end of the 69 steps is the MartinsKirche (St.Martin's Church) which was built in 1101-03 and is the oldest Parish Church in Basel. However it went to alternations throughout history till 1851. Later in 1922, murals were painted. Sadly it was closed when I ventured to here. Another best feature of Basel Town is that its filled with water fountains everywhere and its all drinkable!!! One such fountain is Augustiner Fountain built in 1468. However the present structure is from 1846. Ahead is the most important landmark of Basel - Munster which means Cathedral, which was built in 12th-15th C CE (I'll do a separate post on this Cathedral). Behind it is Pfalz, an observation platform with a spectacular view of Rhine. Further ahead was the Labyrinthplatz, which is actually a labyrinth or a maze on the ground. This was designed by Agnes Barmettler in 2002. All these ups & downs reminded me of Kerala, also where the roads are like this! And further ahead up & down, several slopes and staircases, I reached the Markt Platz again and it was almost night! I retired for the day and the first thing next day morning was........... Wait & watch! The one that struck me is the slanted road and the stairs and the labyrinth , quite impressive , the design of the places indeed tells a lot of stories. Basel is a simple beautiful place, particularly the old part. I was there street walking for just a few hours. Your captures reminded me of the sights I saw then. Never been to Switzerland. Or Europe for that matter! It's great that I got even a glimpse of it from your trip. Thanks! Such a very beautiful place. I am also dreaming of visiting Switzerland, and explore Basel. Have you heard of the Annual Baselworld? I always got an invitation from them. (sad) I always can't go. The airport exit could be confusing after a long flight! You sure get some great photos of the stairway of 69 steps. The Munster photographs well too, thanks for sharing. I've been to Switzerland but I haven't made it to Basel, it looks so quaint and charming! I bet the two doors at the airport can be confusing! That's WILD that there are different exits for France/Germany and Switzerland! It's like being at a train station with exits for different streets, except this time it's different counties! So coooool! Basel looks like a great town for exploring. I think Swiss towns are just too cute for words. I also did not know the airport was in France. But it's too bad the church was closed. I just love medieval architecture. I have never heard of Basel but it seems to have a wealth of history. I love that is has the oldest bridge across the Rhine. It is also great that there are so many walking tours there. Your pictures are amazing and I love the airport exit. 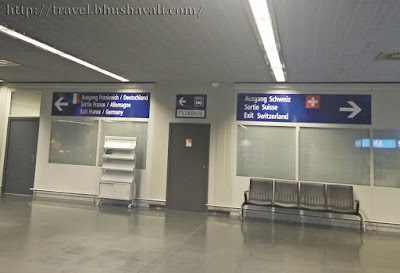 I had no idea there was an exit for France/Germany and one for Switzerland. I've never been to basel. It's great to discover the city through your pictures. I'm very impressed by those stairs! I love the airport arrivals! You can choose Germany, Switzerland or France, would love to go just for that I think haha! I've always wanted to visit Basel though, as all Swiss cities I've been to have been so beautiful! It seems like a very quaint, architectural city, which I love! All the places you mentioned look amazing but the one that caught my eye is the Mittlere Brucke. It just looks so romantic! Switzerland is just so dreamy, isn't it? I wish I could visit one day and see all the pretty places in it! I haven't been to Basel yet but it looks like a lovely city to visit, I loved those little narrow streets! Haven't been to Switzerland but is dying to see the place. I have heard so many nice things about this place. And it is just so very timely that somehow, I have seen a part of it through your blog. All the more that it pushes me to keep this drea of going there someday. That's pretty cool they have an airport for three countries. Never heard of it! The transportation system seems awesome too! Loving the street made out of steps, looks like you had a great time! Thanks for sharing! I haven't heard about Basel though, and this seems to be really an interesting place to visit. Wow, you were able to use your 24 hours exploring this place and it gives you so much memories to treasure. A great in history and I love their architectures. Your photos are truly stunning as well. I was in Switzerland last summer - was amazed by how hot it got. It was over thirty degrees one day! That's cool how you can drink straight out of the fountains - the Swiss are very efficient like that, I find. i would love to visit Basel , it keeps an old flavour which i personally enjoy. It surprised what you said at the beginning about the airport having 2 ways , cause i never saw that before, for sure it would be interesting to visit this place. The Mobility Ticket is convenient & definitely tourist-friendly. It would be cool if most places where people traveled offered that. It would be easier to go around & it's probably safer. Mittlere Brucke, btw, is my favorite. I have this thing for anything that's almost 'old school' or anything that's able to show so much history in it. How interesting that the airport has different exits for different countries! I love any town where you can easily walk around and visit several monuments or points of interest. And how great is it that the fountains have drinkable water - I'm sure that's very welcoming on any hot Summer day! I only been to Geneva and id love to visit basel too looks a great place to explore. The photo by thr bridge looks pretty. I love that sign, if that was me I will be confuse. Such a great place though, my favorite one is the stair way, well all of the pictures you posted are beautiful. I am guessing this is more beautiful in person. I guess if I visit that airport I might need to remember or make sure I have someone with me that knows what to do. Wow! These are so many beautiful places you visited in one day. I think it's tiring to walk that far but it's worth it. Drinkable fountains are nice so tourists won't have to buy water in bottle. Yay for drinkable water fountains! So handy while traveling and save you a ton of money and plastic! I remember Basel. We took a wrong turn and ended up in the wrong country. Sorted out within a few minutes. Three countries in five minutes; as an Australian that's pretty schmick! Like the labyrinth. I walk them when I find them. It's a sort of walking meditation. We've a few here in Canberra, I found one in Amsterdam, and Grace Cathedral in San Francisco has two. There's actual a Labyrinth society that lists all of them in the world! Good thing you know the right exit but then again, it would still be an adventure. I love that the place is not swarmed with tourists. I love walking through the streets in Europe. I am glad this one had coded directions. I wish I could visit Basel, and other cities in Switzerland in the future. This is one of the countries in Europe I still have not visited. I've never been to Switzerland, so this was great! It seems like it would make a nice stop if one was also seeing France or Germany. Great photos! Basel has a vintage city look. It's really a nice place to visit and appreciate the heritage. I had no idea Basel was hot and humid in autumn! You learn something new every day! Oh wow! When I encounter Switzerland, the first thing that comes to my mind are mountains, trees and all the greens. But I guess this is the part of the country where it has building. I so love their architecture here. The picture doesn't look that much, but 69 steps is a lot! Did you pass by the staircase? How was it? The airport is so unique with its multi-exit. I love the photos of bylanes in Europe..totally quaint! What a pretty city! I need to visit Switzerland some time soon. Some friends of mine went to Switzerland relatively recently. Between them and you make me want to go .... I'm glad that you had the opportunity to visit that beautiful country. You'd get a workout just walking the streets--so hilly! Looks so idyllic. I think I would get dizzy trying to take it all in with my camera! It's so cool that the airport has 3 exists, each of them ending in a different country. The free shuttle is a nice touch as well. I really like doing those free walking tour when I am in a new place, you learn so many things from them. Wow that is so interesting that you can leave an exit and be in a different country form someone else! How fascinating. Also those hills look insane. I would definitely sweat walking around there.